Dr. Vaibhav Bhokare is a certified Ayurveda specialist, with over 11 years of experience in the field. Having got his Bachelor of Ayurveda degree, Dr. Vaibhav Bhokare went on to get his Basic life support degree from symbiosis and MD- Ayurveda from SSAM Pune. 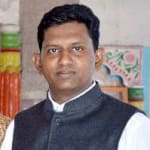 He currently practices at Dr. Bhokare Clinic Ahmednagar and he is the reputed Ayurveda specialist of the region. Some of the services provided by the doctor are: Anti ageing Treatment, Chemical Peels Treatment, Chin Reduction Treatment, Hiv Prophylaxis Post Exposure, Restylane Vital Procedure, Vampire Face Lift Procedures, Acne Treatment, Allergy Treatment and Asthma Management Program. The clinic also specializes in the Ayurvedic massage treatment based on Panchakarma. Dr. Vaibhav Bhokare has a professional membership at MUHS Nasik and his treatment methodologies are highly respected among his peers. Needless to say, that he has got many of the positive ratings from his patients. Dr. Vaibhav Bhokare is well versed in Hindi and English and he offers consultation dedicatedly at the Dr. Bhokare Clinic, Ahmednagar. If you are in Ahmednagar, his appointment can be booked online too.